I spent last weekend participating in an interesting Federalist Society/Liberty Fund colloquium, “International Law, Foreign Law, and the Constitution.” Some of readings for the colloquium discussed the development of the concept of sovereignty in international law. It’s striking how closely the concept relates, historically, to the Protestant Reformation. The great theoreticians of sovereignty were mostly, though not exclusively, Protestants seeking to provide an intellectual grounding for the Westphalian system, people like Grotius and Vattel, though Vattel is more an Enlightenment than a Christian thinker, it seems to me. Even Bodin, the 16th Century French writer credited with the first comprehensive theory of sovereignty, was a crypto-Protestant, at least according to the Tudor secret police. The core components of Westphalian sovereignty were the equality and independence of states. Each state had an equal right to govern itself and no state had the right to meddle in another’s internal affairs. The non-interference principle extended especially to religion. 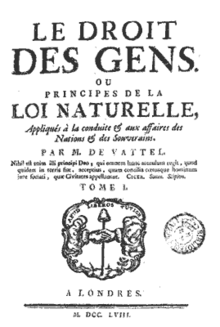 According to Vattel, for example, the Law of Nations, a set of rules derived from natural law, prohibited attempts to impose the “true faith” on a state from the outside. In fact, Vattel argued, even peaceful missionary work was prohibited, unless the local government allowed it. (Vattel made an exception for the Twelve Apostles; they had resisted the state’s attempts to silence them, he conceded, but they could perform miracles). Sovereignty, presented as a matter of natural law, greatly assisted the Protestant Reformers, who were seeking a principled, “neutral” justification for resisting the Catholic Church’s assertions of universal jurisdiction. It takes a natural law to beat a natural law. I think Mark is definitely on to something here.